Bianca Bertalot creates shows that teach and pass on a psychological/therapeutic message that comes from a worldwide concern or issue. 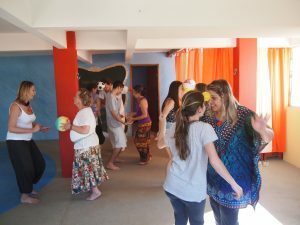 The aimed is to do this in a beautiful and funny way as people can be strongly touched when there is an exchange of laughter, smile and humour. 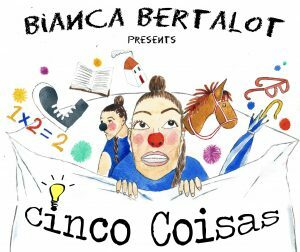 Her new show Cinco Coisas was inspired by the five basic developmental needs of a child – Place, Nurturing, Support, Protection and Limitation – the show Cinco Coisas proposes to lead the public through a purely human experience using various creative artistic elements. The show involves storytelling, dance, play, clowning and improvisation. Boyden System Psychomotor therapy, which focuses on the five types of interactions that need to happen between the child and their caregivers. It is a playful, poignant and inspiring show where two opposing viewpoints, but also complementary – positive and negative, met and lost, abundance and absence – are presented by a single actress, who covers the polarities through the staging of a clown and a lecturer. The aim of the show is to highlight the human vulnerability of the spectator existent since childhood, but doing so in a playful and entertaining way, as is characteristic of the clown. 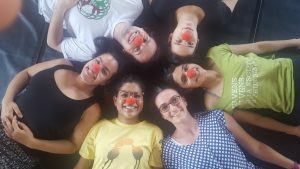 Bianca provides clowning workshops to businesses, private companies, group of adults, students, families and children. Clowning is when you can be, understand and believe in yourself, when you are truthful to your personality, where you can communicate easily to express how you feel. You have courage and feel stronger to do anything because for what humans call mistakes and failures, the clown calls it play. It is through playing that learning happens and strength originates! Playing is any voluntary spontaneous action and experience that an individual can have; it’s anything you do that feels good and enjoyable. Play opens your creativity, because it is perhaps only in playing that you let go of judgement, where you are free to do whatever you want. You create things you wouldn’t create elsewhere. The longer you play the stronger creativity will be.